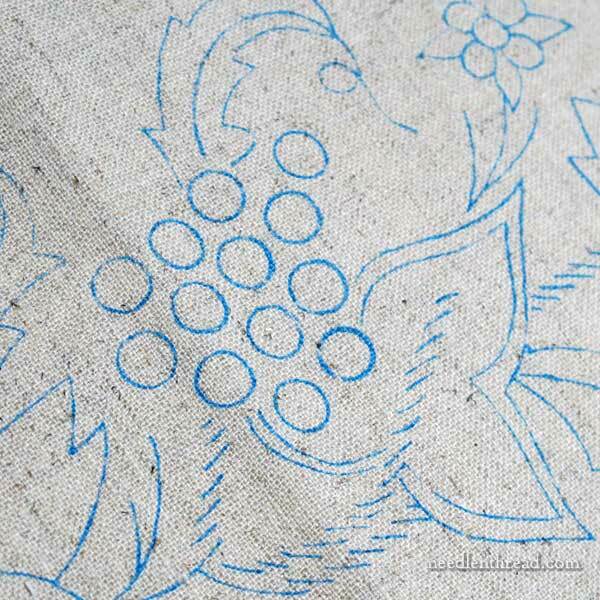 Today, we’re going to take a close-up look at one of Hazel Blomkamp’s embroidery kits from her latest book, Crewel Intentions, which I reviewed last year. The book, if you remember from reading the review, is full of magnificent embroidery projects that incorporate all kinds of stitching techniques, thread types, beads, and other embellishments into modern interpretations of somewhat Jacobean-esque embroidery designs. It’s a fantastic book, full of fun, challenging embroidery projects! Hazel sells kits for the projects in her books through her website, Hazel Blomkamp Fine Needlework. I’ve always wanted to buy one of her kits, to review it for you and experience working through one of her projects, but I’ve put it off and off again, due to time constraints. Well, right around this past Christmas, what to my wondering eyes should appear, but a package whose contents to me were unclear? I sprang to the mailbox, my heart gave a flutter, and I opened the package and started to stutter! It’s…it’s….it’s a kit! I cried. And not just any kit, but Hazel kindly sent me her Late Harvest embroidery kit, replete with fabric, threads, beads, needles, and necessary notions. What a terrific Christmas surprise! Thank you, Hazel! I’m dying to work this kit. And I’ve been dying to work it ever since I first saw the project in Crewel Intentions. But there’s that hovering cloud of guilt, you know. The Hummingbirds… the Redwork Runner. You know what I mean? Like I mentioned the other day when I showed you the finished embroidery on the runner, with that milestone reached, I felt I could at least take the first steps, unpack the kit, and get it ready to stitch. While exploring the kit, I took some photos and looked everything over thoroughly. Now you’ll know what to expect when you order a kit from Hazel. Hazel’s kits can be bought in several different configurations, which I think is Super-Duper Convenient. You can buy the full kit (with everything you need to complete the project except an embroidery frame and scissors), or you can buy just the print pack (the pre-printed fabric), or just the bead pack (all the beads and crystals used on the piece), or just the thread pack or just the needle pack – or a combination. For folks who have easy access to DMC, it might be more economical to purchase the thread at home. But the beads are more difficult to assemble, and there’s the Big Advantage of convenience when it comes to buying the pre-printed fabric from Hazel. If you take a look at the kit contents for Late Harvest, keep in mind that the prices are listed in South African currency. The full kit runs just short of $95US. The instructions are not included in the kits. You’ll find them in her books. 1. Everything is packaged separately and neatly. 2. Full skeins of floss are included, instead of small estimated cuttings. 3. The beads are packed individually in small zip-lock bags, labeled, and affixed to a convenient strip to keep them all together. 4. The fabric is prepared and ready to go. The grape bunches are my favorite element in this design. The individual grapes consist of these little topaz crystals, which are much smaller in person than I realized when looking at the images of the project in the book. They’re so pretty! The fabric that this project is worked on is a cotton / linen blend, so it’s a little spongier than a 100% linen fabric. Still, it has a nice hand and it’s easy to stitch on. The design is screen printed on the fabric in an easy-to-see blue. The lines are indelible, so it’s important to cover them completely with the embroidery. This is dreamy! There’s nothing like sitting down to start a project, and having everything so meticulously prepared for you. You don’t have to do any prep work on the fabric before setting up your embroidery frame! The ground fabric is backed with a white cotton, to support the embroidery. The two fabrics are sewn together at the edges, so there’s no worry of separation or of fraying. Isn’t that great? You don’t have to prepare the fabric at all! The only way it could be readier would be to have it come already mounted on an embroidery frame! Speaking of embroidery frames, it’s better to use a frame for this piece because of all the beads and crystals. The piece requires a relatively large frame. If you’re using stretcher bars (I’m using Evertite stretcher bars for it), the project requires a 22″ pair and a 12″ pair. You can also use a slate frame or a Millenium frame if you have either. The fabric is 24″ wide by 14″ deep, so whatever frame you use, it should be able to accommodate that size fabric. The needle book in the kit contains all the needles required to do the embroidery, with two of those that will get the brunt of the work (just in case). The needles are clearly labeled. 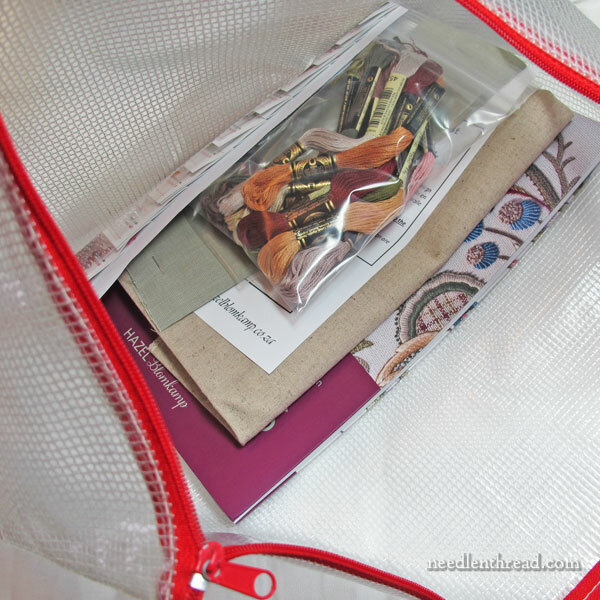 After I sorted, examined, and separated the kit contents, I put them in a mesh zippered project bag along with the book. When I get a chance, I’ll photocopy the project pages in the book and put the book back on my shelf. You do know you can do that, right? When you are working a project from a large book, often it’s easier to photocopy just the pages you need from the book, rather than lugging the whole book with you. As long as the copies are for your personal use only, this is perfectly fine to do, and it makes following the instructions and carrying the project around so much easier. 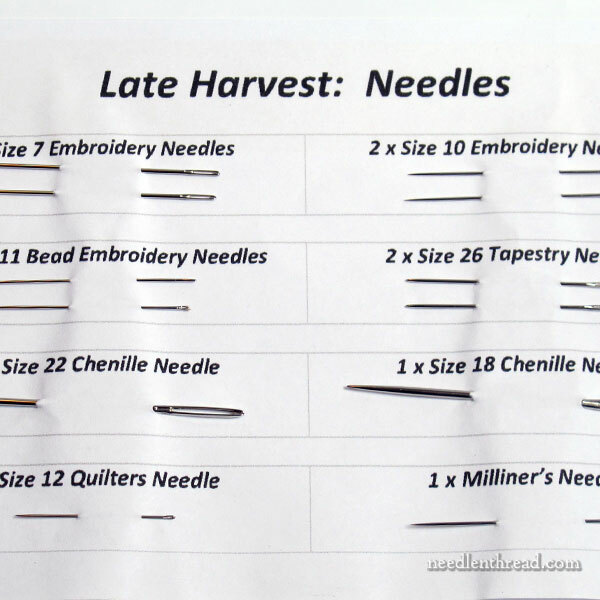 The Late Harvest kit is one of the most thorough and organized embroidery kits I’ve ever seen. It’s got everything you need for the project, and it’s immediately ready for stitching as soon as you receive it. 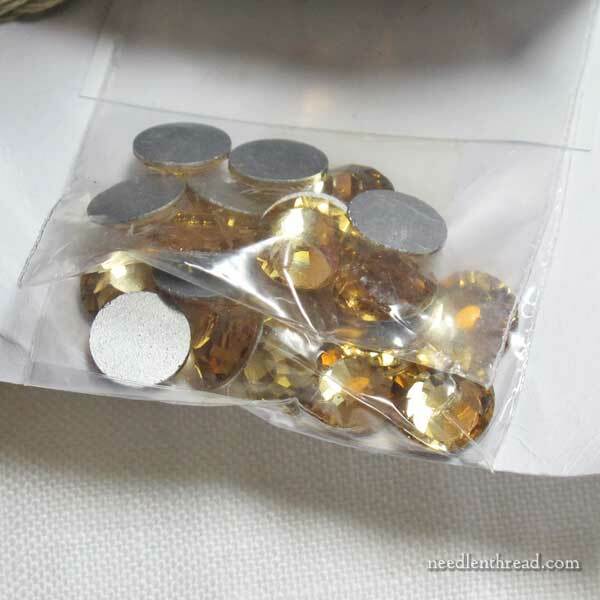 The threads are reliable DMC threads, the fabric is a decent fabric (all prepared for you), and the beads and crystals are high quality Japanese beads. The pros, then, are pretty obvious! The cons? Well, I know some people will say the kit is expensive. Considering what comes with the full kit and the preparation of the materials, I contend it’s not that expensive. Remember, every step of preparation, whether it’s weighing beads and bagging them, cutting fabric and sewing it, silk screening, fixing all the needles in the needle book, all the packaging of each item – this is all done by hand and it takes a lot of time to do it. I’ve said it before, and I’ll say it again: the most expensive thing you put into your embroidery projects is not really the cost of the materials (no matter how much they cost!). It’s your time and effort. To create a large piece like this with the embellishments required to finish it, considering the amount of time and effort that will go into it, $95 is not that much. There’s also international shipping to be considered. Shipping from South Africa runs anywhere from about US$20 – $45, depending on the courier you choose. Hazel offers two postage options. And then, there’s waiting for the package to arrive – but I would just call this Sweet Anticipation. It’s not really a “con,” unless South Africa has another postal strike. But that’s why Hazel offers two shipping options. If you’ve been longing to work one of Hazel’s projects and this one appeals to you, you’re most welcome to stitch along with me. For me, this project is purely for fun, and I intend to take my time with it and work on it as an indulgence. It’s not a typical stitch-along project like the kind I usually work here on the website, because obviously, I can’t give you the pattern and the stitching instructions. That’s all available in Crewel Intentions. But I’ll update you on progress, and I’ll probably troubleshoot a few areas (I always run into snags when I stitch), so if you’d like to work the same project this year, you’re more than welcome to join me. If you don’t want to spring for the kit, you can source your own materials locally using the supply list in the book, make any substitutions you’d need to if you can’t find them all, or even alter the project in any way you’d like to alter it, to suite your own personal taste. For me, I’m looking forward to working on the project as is. I like the idea that I’ll be following someone else’s directions. Two other reasons I’m looking forward to this particular project: 1. I’ll be working outside my color comfort zone (they aren’t normally colors that I work with); and 2. the project contains some stumpwork elements, and I haven’t done any stumpwork in a long, long time. 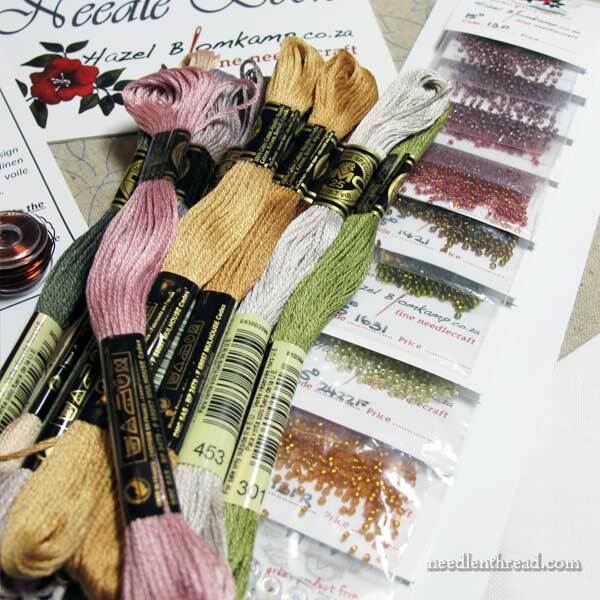 Have you ever stitched any of Hazel’s projects? Any insights you’d like to share? Or questions you might have? Feel free to leave a comment below! January 6, 2016 Late Harvest: Long & Short Stitch, Inside Out – It Works! I was given Crewel Intentions as a gift, lucky me. I’ve really enjoyed looking at it and look forward to seeing your work from it. I haven’t been brave enough yet to actually use the book! After you reviewed “Crewel Intentions”, I ordered both of Hazel’s books and really enjoy them, Mary. I’ve wanted to do some of her projects ever since, but other commitments were a priority. Maybe this year, if all goes well. I shall enjoy watching as you stitch Late Harvest. Wow – I LOVE this. I wish I could stitch along with you but it is impossible at this time. I will save this as a resource, though. It may be a bit expensive, but as you say it is coming from South Africa and you get a kit that includes everything, which is terrific. Thanks, Mary! Yes yes yes I’ve been working on one of Hazels projects. I bought the book last year at quilters fancy. I absolutely love her designs and her book she says rules are made to be broken which is why she has a new unusual and delightful take on the crewel embroidery and I love it.ive been working on it with three other ladies . I couldn’t easily find the right fabric and the local bead shop didn’t have the exact beads but we substituted and we’re doing fine .we are working on autumn lace which is actually in crewel twists which is the book before crewel intentions.the lace part is a challenge I emailed Hazel about this and she responded quickly which I thought was great and helpful . I love the autumn harvest design and would love to work along with you, it was my next choice. i am working on crewel intentions – pertinacity and a sherry for jack. 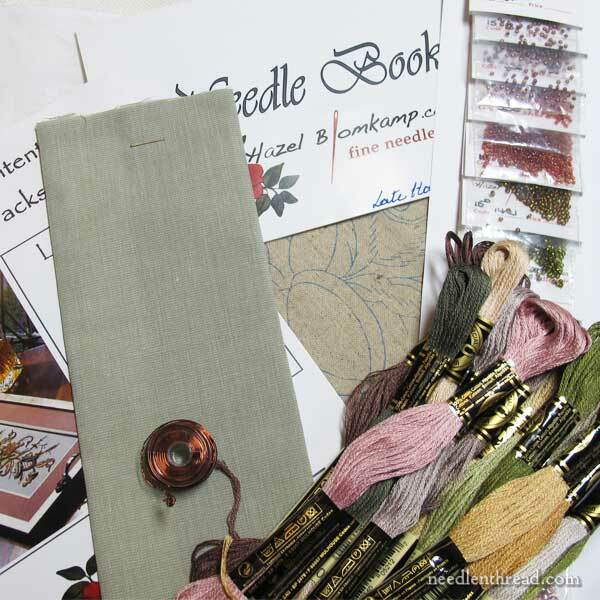 i ordered the fabric print packs from australian needle arts in australia. excellent service the fabric packs where $18.00 each and total shipping was $14.00 and I had the items in my hands within 15 days. i was very impressed with the fabric preparation. I do have a question as i have never worked a project with a backing fabric is there anything i need to know or be careful about. i quess i worry about it bunching up on the back. i plan to use a round hoop. any advice. before your post this morning i was thinking about removing the backing fabric as the front fabric hopsack is very firm not sure why i need the backing fabric. i cannot wait to start this project. OMG, I love her work. I’m currently working my first traditional Jacobean embroidery (one of Tanja Berlin’s pieces), but many evenings, I just leaf through this book by Hazel Blomkamp (I have both of them) and study it, and read it again, and think how I might be able to do it. I agree, the price is fine. I can’t believe how well this kit is prepared. It looks fantastic. I promised myself I wouldn’t buy anything new for two months. This will not be easy. Can you purchase at her site with Pay Pal? I recently had a bad experience after purchasing something from Australia and don’t want to get a new charge card again. I love all of Blomkamp’s work. And I have my new Just a Thought floor stand on which to work. That, by the way, is wonderful, a truly worthwhile purchase. I wanted to get enthused about needlework again, and guess I have succeeded, thanks to you. Thank you so look much for the frames information. I had sent you a request about “embroidery hoops” and I imagine you were appalled/horrified at my obvious inexperience especially with such an up-scale project. This information is so helpful. I was given Crewel Intentions for my birthday this month (yay!) I loved every design, but the Late Harvest project was my absolute favorite! Considering the time spent on stitching a special piece, plus sourcing all the bits and pieces, I don’t think this kit is expensive. I’m sure it is well worth the price. Now I know you will be stitching it too…. (moral support? )I will definitely treat myself and order it. I don’t normally comment all that much but this is THE most beautiful kit I have ever seen. I will have this someday! What a lovely surprise present I bet you were delighted and a lovely Christmas present. It so nice to see the contents of the package nicely packed and a nice new project for you which as you say looks fun. I look forward to you starting the project and letting us know all the detailed stitching involved which I’m sure I will learn a lot from. Good luck with your new project and thanks for sharing your lovely present with us and for showing us the contents. I was inspired by an earlier review you did to buy this book and the kit named “first sip” (I think! – it’s all blues – and my only concern is that instructions for the needleweaving are minimal so I am struggling to get something that looks good. The kit you chose does not have as much of this needleweaving and I hope you will talk about how to do it when the space to be filled is not at all rectangular. I love the kit, and Ms. Blomkamp responds to questions quickly if you write to her! I too am looking at doing the kit from Crewel Twists that involves needleweaving. I agree that the instructions on how to needleweave aren’t clear and am hoping someone will put together a video of the needleweaving shown in the Crewel Twists book. Well, well, what a wonderful surprise! I’m glad that you are blessed by those in the embroidery world. You bring attention to their books, sites, companies etc. Hazel is a lovely person. I went on the Mekong River cruise organised by Inspirations magazine and Hazel was my tutor. here were only four of us n her group and she paid especial attention to two of us who were just trying out the special stitches for the project – A Sherry for Jack. The other two went straight to the project. I haven’t started the project yet as I a trying to finish a sampler first that I have been doing all last year. I do not think the projects are expensive for what is contained and I am sure you will enjoy doing yours. I bought the book Crewel Intentions before it was even published because I knew it would be beautiful and different. That’s why we have to purchase books, right? Just to look through the pages and be inspired or see a technique that we just can’t wait to try! After seeing the kit I must admit that I am very jealous – I must have one too! Offering the kit in a variety of ways shows excellent marketing skills! Thanks for your daily needlework news – I find it truly educational and inspiring!! I am wondering what brand of beads is included? Are they Mill Hill, Toho, Delica? Can you tell? I stitched the “midnight meander” pattern, in black and white. This is definitely my favorite piece of embroidery. I do not own this book, but I may buy it just to stitch along with you. When do you plan to start ? 🙂 Don’t tell anyone…but I already started! I wasn’t supposed to, since I haven’t finished the runner or the hummingbirds yet, but I just couldn’t resist. Shhhhhh! Hi, love your site! My day does not really begin til I read your piece for the day! Could you explain backing fabric on emb pieces, pros and cons etc? Hi Mary: I also have both her books. I actually have an extra which I will use for a give away in my Facebook group after the Nashville show. I absolutely love Hazel’s designs and think the price for her kit is not bad. Having put kits together myself I do know the work that goes into it. I am really considering ordering this kit from her just so I can stitch along with you. If you start it after the Nashville show I will for sure. Thanks so much for the review and thank you double much for all your wonderful posts that I look forward to each day. Judy — Still loving your stand. A lot of thought went into the The Just a Thought needlework stand. By the way, I love Hazel Blomkamp’s work as well. Oh lucky me. I purchased Hazel’s book some time ago and sourced all the beads and the topaz crystals for the grapes, which took quite a while. I think the late harvest picture was sooo pretty. I didn’t mind the stumpwork part, but the weaving was troubling me. I’ve never done that before. I have to admit it was slightly putting me off trying it out, but now you are going to give it a try, I shall print it up and put it on my frame ready to go. Hazel does the most amazing embroidery. I have both her books. In fact I have all the threads and beads ready to do a project from her Crewel Intentions book. I thought the black and grey combination one would look lovely on front of an evening bag!! Now I can’t wait for you to get started to help me out!! I reduced the size of my project and it’s not a good idea. I’ve done the centre section of Autumn Lace in Crewel Twists and it’s beautiful, it really is, but I made the mistake of reducing the size of the pattern thus making it more difficult to fit in the stitches, and it wasn’t possible to add the beads. It’s not easy!!! But please advise your readers not to reduce the size. Pat BATB 2012 I took Hazel’s pomander class. It was lovely and she was a delightful person. I have had the privelege of doing workshops with Hazel. She is absolutely lovely and so much fun! She is so patient. Her kits are stunning (like her). How I miss doing her classes. I have even sooo tempted by Hazels designs in Inspiration magazine and her books but have resisted ….. So far! I have the Secret Garden to finish and a Few other small projects. I love that Hazel works crewel designs in DMC cotton rather than always wool. And I amsure Hazel won’t mind if I remind you that your Local Needlework Shop may stock them also. Just ask! I bought both books after seeing your reviews, and they are gorgeous, gorgeous, gorgeous! I’m so glad that you will be stitching one of the projects and are willing to share your insights. All I’ve done so far is look at the pictures – I’m afraid to make a messs of something so luscious and beautiful. Mary what will you use this for when completed? I have everything I need to make this (I love it) and two other designs from the book too. I bought the fabric and bead kits from my LNS; they were more expensive that way but if you don’t support your local shops they won’t be there fore very long. As yet I haven’t started … I’m a bit nervous as so far I’ve only done one piece of crewel work. I really, really enjoyed it though. I’m working my way up to Hazel’s patterns by doing a couple of other things first; and I expect I’ll be making a great deal of use of a doodle cloth. I look forward to watching your progress on this. I’m sure it will be full of helpful tips and observations. I enjoyed working on Jacobean tangle and Just Jacobean from Hazel’s Crewel twists. In the past weekend I tried to find all the materials for two other projects, Midnight meander in Crewel twists and Vyesna Prishla in Crewel intentions. Just like one of the viewers mentioned it’s hard to find the right fabric here in the US. Any idea where to get the linen/cotton blend fabric, or what is a good substitute for it? This kit makes me very jealous and perhaps it’s time to give myself a treat. Well, if I were sourcing the fabric myself, I’d go for a 100% linen, just because I prefer stitching on it, compared to blends. It depends on the color of the background. If the backgrounds are neutral, I’d go for a high count Legacy linen in creams, off-whites, natural colors, white. If the backgrounds are colored, I’d have to see the fabric to know what to look for, and then I’d just explore until I found something that would work. Ulster linen makes some medium weight linen in colors, but the weave might be a bit open – but if you back with a cotton fabric, that might not be a problem. Mary, just a heads up: when clicking on the images to embiggen, they go to a 404 – not found page. Ah, thank you for letting me know! Just fixed it! My Big Project is doing the round “Pertinacity” design from Crewel Intentions. What a learning curve! I was intrigued by the check design in the two large flowers – and thought that they were bits of material that had been appliqued on. But no – they are ‘needle weaving’ – and what fun I am having doing it – getting it even, and the pattern correct. I bought the book and the pattern, and then the threads from local suppliers in New Zealand, but could have got them from ZA. I am using Evertite stretcher bars – two pairs of 16inch, which I had to get from Australia. I WISH I had a System 4 floor stand! This will be the most complex work I have done – what a challenge. I will be following your wisdom, Mary, with close attention! Good Morning Ms. Corbet, This latest embroidery and crewel activity is very intriguing to me. I hope to get my husband to build me the frame. The kit was very pricey, but the organization of materials and instructions were worth the money. What a good idea to roll the different types of needles in a piece of fabrice, with each needle labeled. I am working a Hazel Bloomkamp kit now. The full kit is amazing but more importantly Hazel is so amazing. I had some trouble with the payment method, Hazel worked very hard to get everything straightened out. She emailed me many times, and when it was a straightened out she, emailed just to let me know if I had any question while working the project to let her know. I have not needed to yet, but I am sure she would be very helpful. ohhh my! i can’t wait to see this. i commented not long ago on your review of Crewel Twists, mary, and i ended up buying it after your response. i love the book – love hazel’s writing especially, but of course also the luscious designs – and i will be relying on it for many ideas and stitches until i’m stashed-up enough to try out one of the actual projects. looking forward to seeing you work through this! 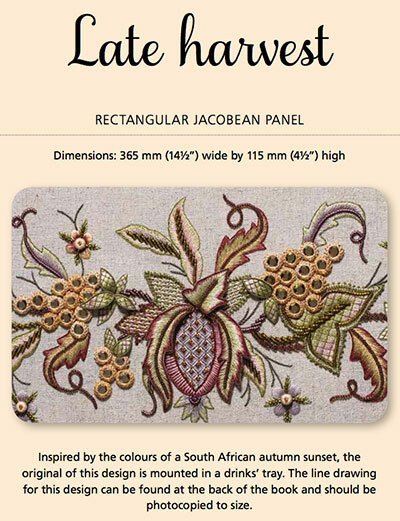 I have just ordered Hazel’s Crewel Intentions and waiting to delight my eyes with your creative and cute designs. Mary, sent you an email at an address I found on the website somewhere and have never received a response, wondering if it went astray. It was pertaining to the harvest kit you received as a gift – I was writing to tell you I would be OH SO pleased to work it for you (after all, the joy is in the doing, no matter who gets it in the end, right?) Anyway, there was no response and I didn’t even know if you got it – I was serious, though. I have been wriggling with impatience since discovering that I AM A WINNER of “Crewel Intentions.” I will stitch along using material from my needle work and bead stash. Just let me at it! Thanks again, Mary, for all the stitching fun. You get what you pay for is very true in the instance. Don’t complain about the price especially from Hazel. Her kits are well worth it. Seeing your tip on spraying the mounted fabric so it shrinks, made me laugh, a lot. I do that but learnt a very good lesson as was soon became very apparent. Smart aleck me sprayed the fabric and as you say just a fine mist. But alas my stupidity became very apparent. I watched as my pattern disappeared before my eyes. So the moral of this story is don’t use wash out colour pens. Haven’t used one for 10 years. This kit is beautiful. I’ve just discovered Hazel Blomkamp’s work and I think one of her designs is going to be my next project. (I’m pretty intimidated though, because I haven’t done much crewel work). Anyway, much as I hate to suggest not buying everything directly from Hazel, the shipping from South Africa to North America is pretty expensive. A great source for beads in the US (if your local bead shop doesn’t have the right things) is Fire Mountain Gems in southern Oregon: http://www.firemountaingems.com. I know they have Miyuki and Czech glass beads, and just about anything else you can imagine. You do have to order some types of beads in largish quantities (i.e. 50g packages for the Miyukis), but hey, then you have enough for several projects! Exquisite project. I think the value in having a well-organized kit of quality materials is worthwhile. The time spent shopping and assembling all the items would be better spent on actual stitching time. If I did not have so many projects already, I would order one. Happy New Year! I look forward to your new projects and lessons. A new year and a new headache. Thought I would get on top of a few to dos. Well that was my first mistake. You know when you look at the items that need to be completed, you know full well that you start with the oldest? Only fair, its been there the longest. Not for this bright bunny after getting all the jobs together and sorting what I would do first. Guess what? My stack was neatly sorted into what I liked best. But to my credit the oldest did win out as it had the least to do. One of my ‘to finish’ is Hazel’s Late Harvest. I was lucky as I bought it from a show when she was out here. I bought the whole kit. I could have got the small kits but my rationalising was why??? If I got the smaller kits I would still have to get the extras at some time or other and this way I had no excuse for not doing it. Even so it is in my unfinished pile. Why go to all the bother of getting the bits later. Hazel might be out of the beads etcetera, so then it is matter of trying to find something to go with it. Well maybe but if you can’t you will have to substitute. Could not be bothered. I like Hazel’s original that’s why I bought it. Mary as for the stump work cloth being smallish I just sewed a border on it and stretched into the frame. There is nothing worse to finding you have a LOT of frames and not one to take what you are doing now. I stretched mine over an ever tight. That way I have more room to work on it. Big hands. The rest I have on my Millennium. 30″ X 12″. Fits a treat. As for postage from South Africa. Well it seems it is over the top from most countries now. The US dollar is at the moment twice our Australian dollar. My advice is to see if someone is selling Hazel’s items in the US. So there you are Mary and all. Have a great year may all you news be good and you make a big hole in your to do pile. Hi Mary, You being interested in crewel Embroidery with beading, are you trying to lean towards going to Dala Floda Embroidery soon, I hope? I would love to see that featured in your newsletters. I hope to go to JoAnn’s Fabrics on Monday this coming week on President’s day so I can find some red and black 100% wool for the Dala floda Swedish costumes for my Kirsten Doll and Malena who is a porcelain 31″ Modern Artist doll. I hope you get around to coming over this way in doing and showing off your embroidery. Especially since it is so Snowy and bleak outside before Spring. The bright,brilliant colors of these embroidery flowers are sure to inspire others to wake up and notice how beautiful this art form really is during the Winter months. I’ve been an avid reader of your column for a few years now and always follow along with your projects. I received the Late Harvest kit as a Christmas Present and have been keeping up with you and have now over-taken you but, looking at your latest pictures I wonder if you have fallen into the same pitfall that I did. Are your first stumpwork leaves large enough? I found when I looked that the printed pattern in the book on all the other groups was the correct size, but that the first group needed enlarging. I’ve sewn them both sizes but haven’t actually cut them out yet, but did think I’d mention it. I just had to write to say how much I enjoy your postings about the current project you are working on. I’ve done Hazel’s Paper Weight and I’m taking her class at this year’s Beating Around The Bush Week at Adelaide, Sth Aust in Oct.
I’ve just purchased The Marian Medallion Project to see what you were doing in 2012. I’ve also purchased your other e-books and will definitely make the Lavender & Honey sewing set. I’ve only been on your mailing list a short time but it is always a great read, especially previous things that you refer to so I can go and see what you were doing. All the best for your treatment which I’m sure will be successful. I was wondering what type and gauge of wire you used on the stump work elements of this design? I’m currently embroidering stump work for a dress but don’t want the wire to rust and discolour the threads. Would paper wrapped (cake decorating) wire fall apart in a washing machine? Any recommendations would be appreciated! I have her book but would like to order fabrics in US if possible because of shipping. Where can I find fabrics comparable to Helen’s? Hi, Deborah – Hazel uses a linen cotton blend. 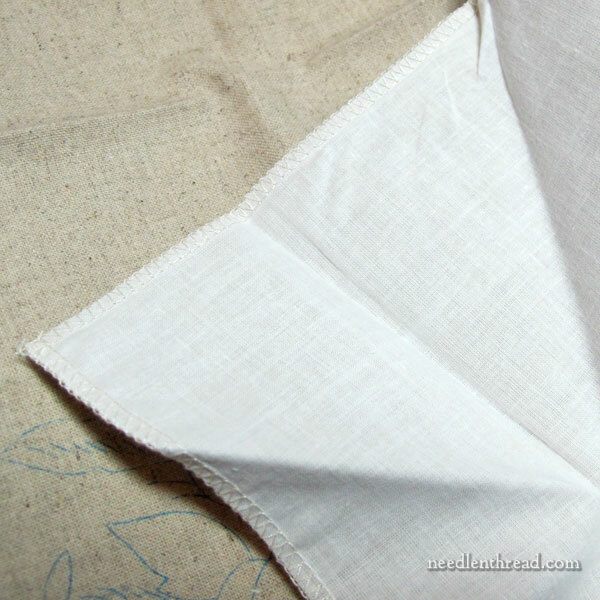 If I were doing it from scratch, I’d use natural Strathaven linen, lined with muslin. You can find Strahven linen through Needle in a Haystack online. You should be able to order it in a specific sized cut rather than by the yard. I am loving doing the late harvest tray- its absolutely amazing. I am nervous I am going to run out of some of the colour green beeds. Number 151631 – do you think it will be possible to get more of this?